← Can you identify these cousins? Just wanted to say a big “Thanks!” to Sophie and John Knapp for sending in this photo of Aunt Grace Kline Gray. It’s always nice to have a face to go along with the name – and remembering those we love is one way to keep them and their memory alive. I never had the pleasure of meeting Aunt Grace in person, but thanks to Gary’s and others’ memories of her, I feel like I know her. And now I know what she looked like – doesn’t she look like a lady that enjoyed a good laugh? I posted the entire photo on the photo gallery tab. 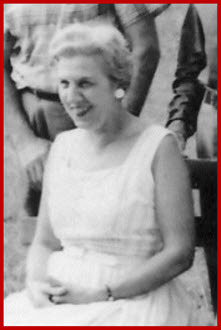 The rest of the photo includes her brothers, Ervin, Gust and Joe – along with her sister, Florence. So take a peek! I have also uploaded my entire collection of documents on the Documents tab. There are death certificates, plat maps, U.S. Census data and other items there for those of you who are interested in the source material. I also uploaded some new photos to the Photo Gallery tab of some antique cars that may be of interest. This entry was posted in Family History, Photos and tagged Ervin Kline, Florence Kline, Gary Knapp, Grace Kline Gray, Gust Kline, Joe Kline. Bookmark the permalink.